It's Going to be a Great Summer in Wyoming! I'm chomping at the bit waiting for runoff to settle down a bit! It may be awhile on some of the major drainages given the snowpack in the Wind Rivers is 200% of normal as is the Shoshone Drainage coming out of Yellowstone. 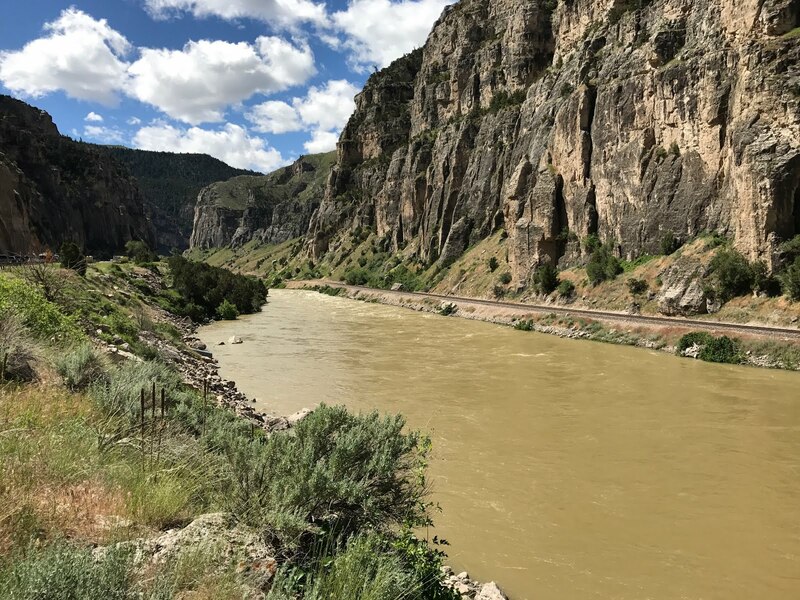 With the Wind River below Boysen Resevoir running at 19000 cfs and the Bighorn below Yellowtail Dam at 11,000 were waiting for our local freestones to drop and clear. I think by next week, there will be a lot of rivers in the state that are fishable! With all this water, it should be a great summer for the trout! I'll report back soon! Great day! 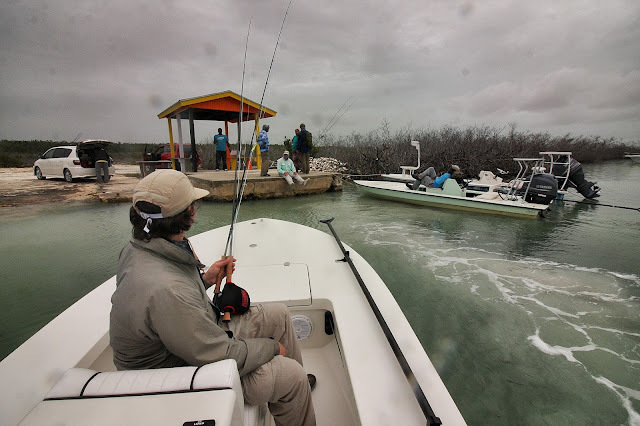 ....Jim Woollett and I left the dock and motored out of Turtle Sound in very windy conditions. 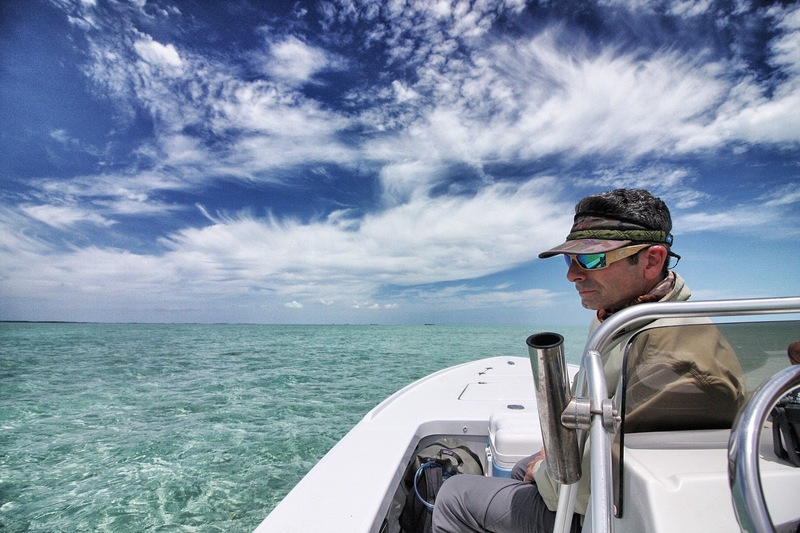 Our guide, Clinton Scavella, eventually pointed us east towards Acklins Island. The seas were choppy and festooned with long white lines of foam. We pressed on through this messy water hoping to reach a few cays between Crooked and Acklins. 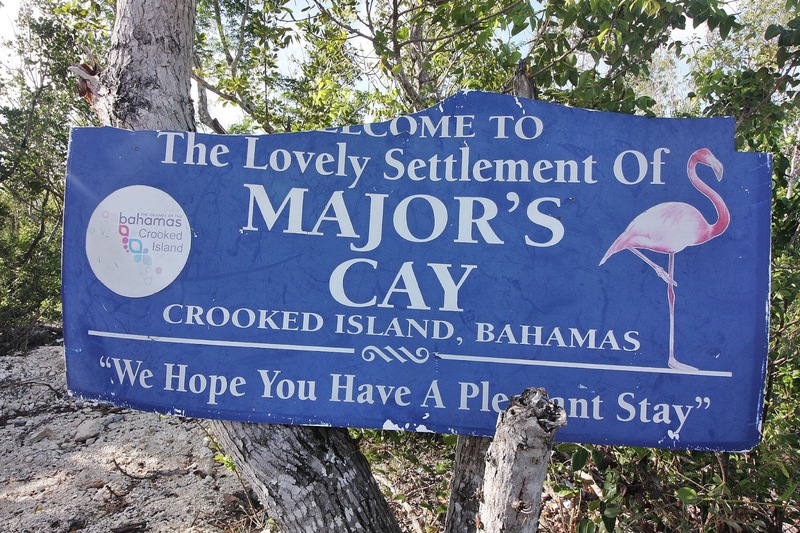 We wanted to reach a spot we had fished last year... Clinton calls it his "C-Spot". We eventually arrived a bit “shaken, but not stirred”. We jumped out of the boat eager to walk off our sore butts. Clinton anchored well offshore anticipating any weird tide flows that might be created by the windy weather. We packed water and a bit of food knowing we might not be back for hours. 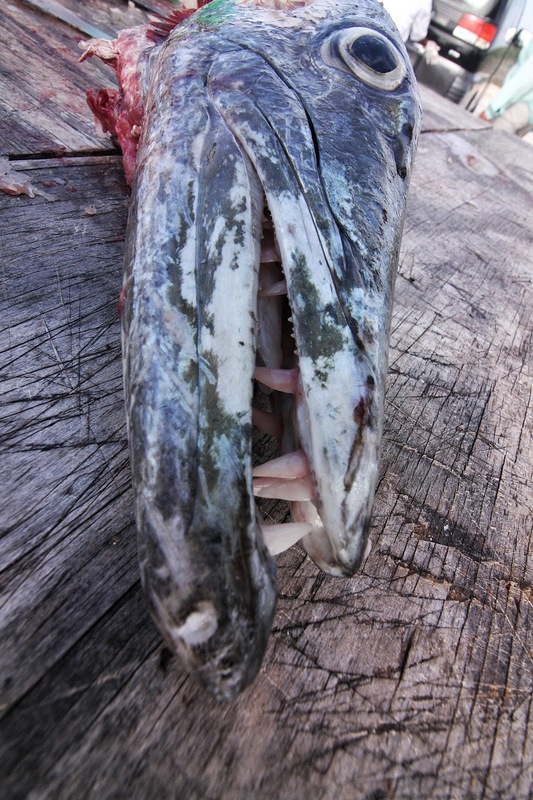 We fished initially on the outside of a huge bay. Here, we hoped to find fish holding on the ebb tide waiting for it to turn. Good call! I caught a few fish, then waded one of the stubby fingers that cut into the interior. Clinton and Jim did the same choosing another digit a little further up the coast. Clinton obviously had the same thought as me. He didn’t want to miss the rising tide. If you do, fish that were in front of you one moment are suddenly hundreds of yards behind you the next. 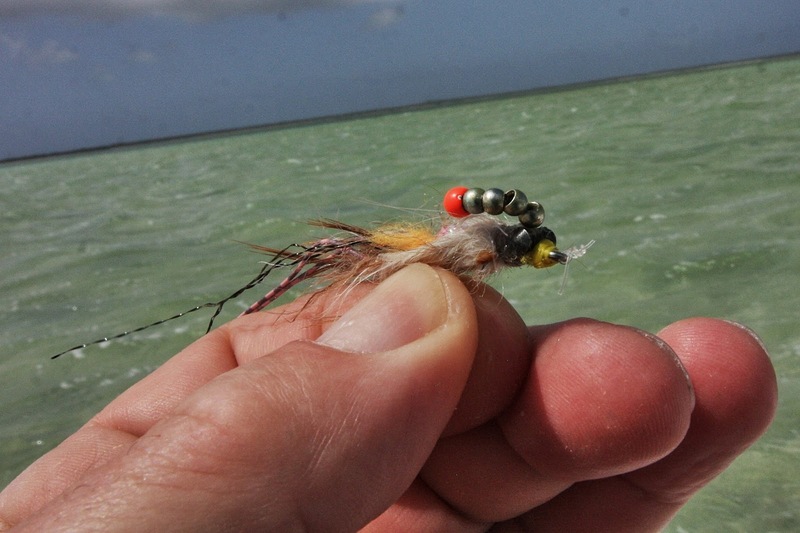 Once inside the finger, I almost immediately began seeing fish in incredibly shallow water. 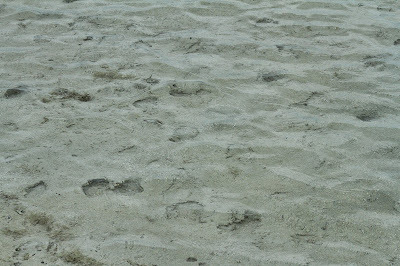 These bones were surreptitiously filtering in seeking the shallowest of spots where crabs, worms and shrimp were just being flooded by the rising tide. This was the beginning of a great few hours of fishing. The fishing was simply wonderful. Yes, we had no sun, the wind was 20+ mph and huge rain clouds loomed on the horizon, but it could not have been better over these few hours. It all stopped when the long-promised rain squall finally slammed into us. I quickly donned my rain gear and hunkered down on a sand bar with my back to the wind. With water pouring off my visor, I chomped on a Kit-Kat bar thrilled there was no lightening or thunder accompanying the squall. I waited patiently as I was pelted with rain and chilled by the the strong winds. Just after the rain stopped, a strange thing happened. The tide’s march inland stalled and then stopped... with still many hours to go. Apparently the high winds had pushed at the tide halting its rise. 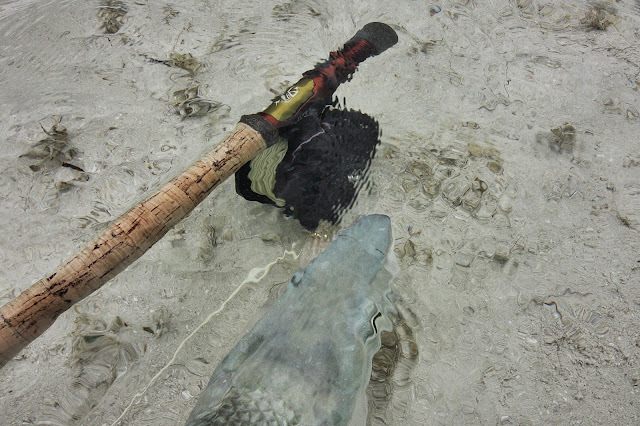 In the space of one half hour all the sharks, rays and bonefish had disappeared. It was if the wind had blown them away. I could see Clinton and Jim walking back to the boat and I soon joined them for another late lunch. This was a spectacular day with a very unusual conclusion. 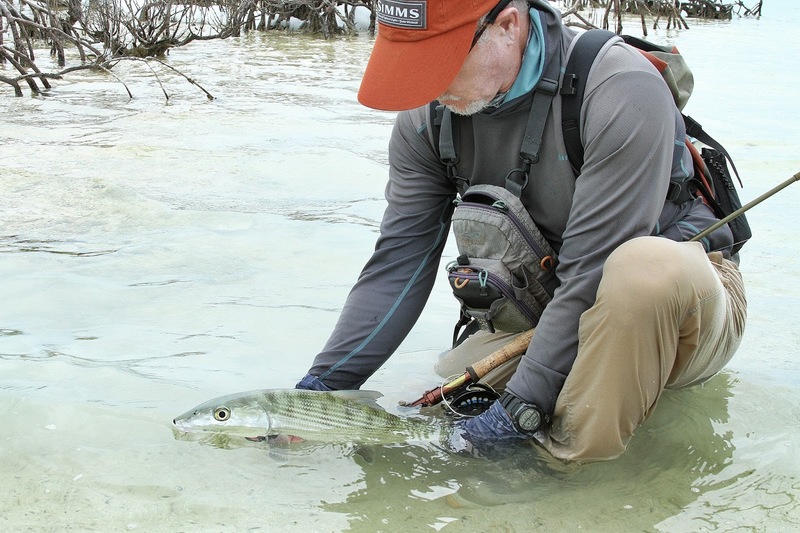 We spent the remaining hour of the day blind casting the mangroves for tarpon. We had no takers, but a 50-60 lb. 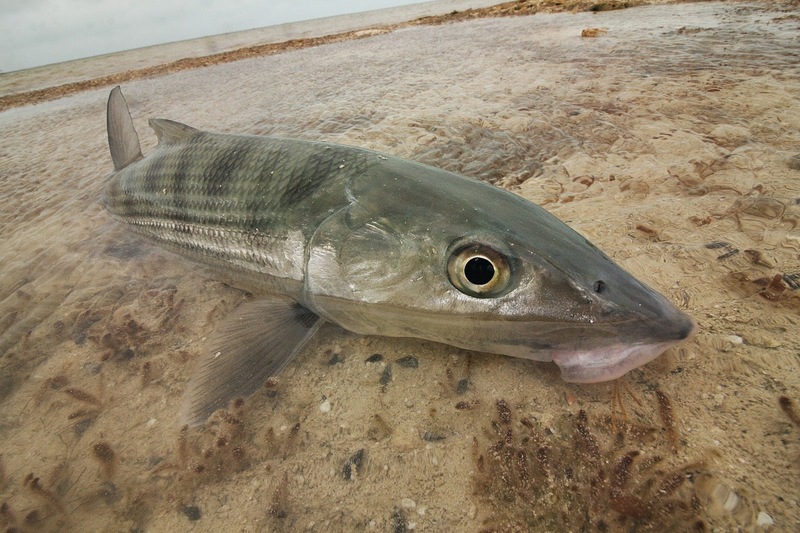 tarpon did roll next to our boat providing solid evidence that they were there! Steve Peskoe and I again fished with Elvis on Acklins Island. On this blustery, overcast day we tolerated the solid 25 knot winds. On occasion, we were knocked off balance while wading by gusts exceeding 40 mph. These conditions made the fish very spooky. The first flat we fished was very unproductive and the second flat very difficult as the fish were blowing up at the sound of the line or the fly hitting the water. 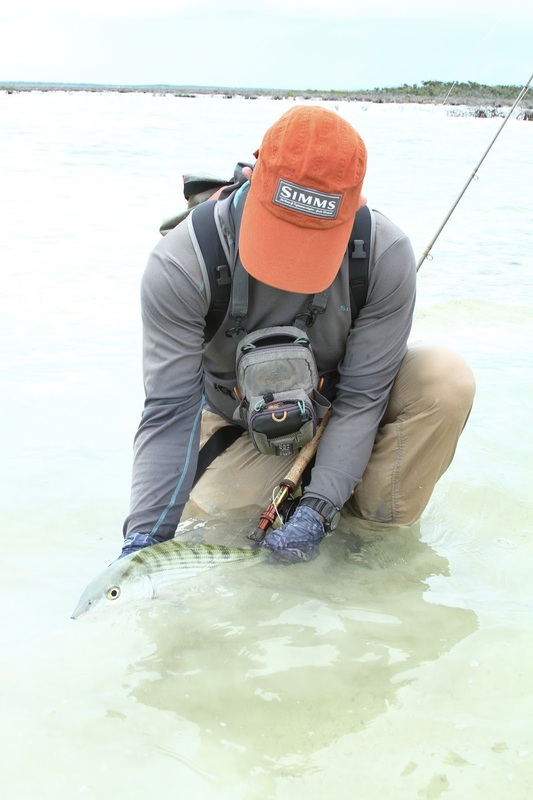 The only way to catch fish was to cast well ahead of the fish, barely bump the fly and then never move it again. I managed to catch a few in the 5 lb. range and Dr. Peskoe caught a 9 lb. monster! This was the fish of the trip and probably one of the top 10 in his illustrious angling career! Congratulations Steve! 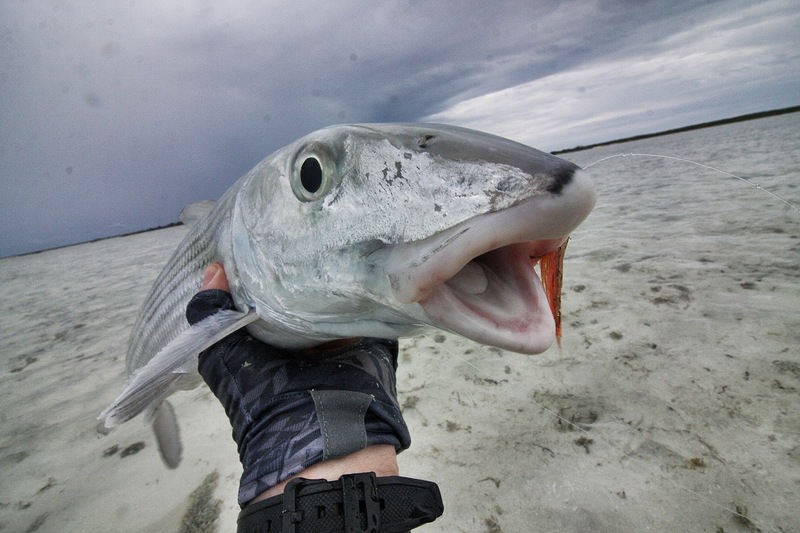 On the last flat we fished, a broad area of beautiful white sand, we saw plenty of fish. 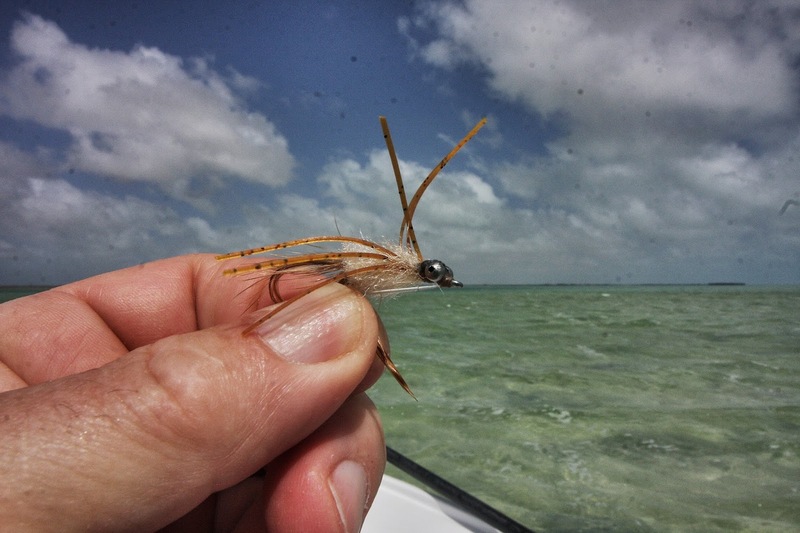 We caught a few, but it was tough as the dropping barometer combined with the high winds made “Chicken Littles” out of these fish. They blew up at the slightest provocation: fly hitting the water, line in the air, arm raised or seemingly nothing at all. It was tough, but very engaging as we were often surrounded by very pale, almost invisible fish in choppy wind blown water. Despite this we took off for home happy bunch. 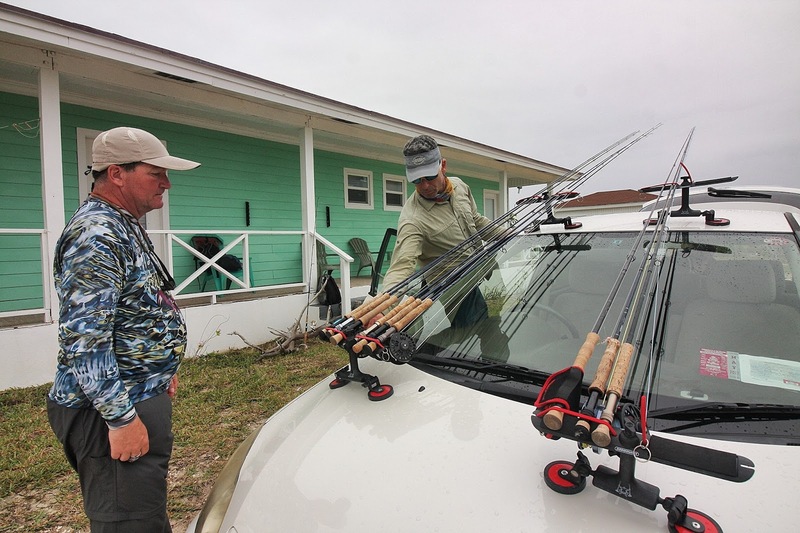 On our last day, Scott Sawtelle and I fished with my old friend, guide Kenny Scavella. We finally had sun, but the high winds had not left with the cloud cover. If anything, they seemed to be increasing. In the morning, we fished an extensive creek system catching numerous fish fleeing the falling tide. Our fishing was great for a couple hours then, when the water got fairly skinny, we could find no one to play even at the creek mouths. Kenny's push pole... enuf said! We ate lunch, then traveled to Nunya Flat (as in Nunya business). Nunya is a huge white sand flat that is domed in the middle and falls off slightly on three sides. As we waded towards the domed center, I knew Nunya can be great or it can be very tough. We would soon find out. 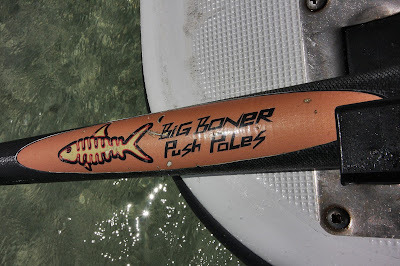 When we reached knee deep water, we started to see a few fish. Scott and I both quickly picked up a few, but the conditions were very tough. Our high winds had created long lines of dense foam that danced across the flat casting shadows on the bottom the mimicked bonefish. In addition, the real fish were the palest of silver and very nervous. We struggled to separate "fact from fiction". What was surprising was the size of some of these fish. I'm sure a few were pushing 10 lbs., but given our conditions, we didn't pick them up early enough to have a chance at these wise monsters. We had to settle for their smaller brethren. This was a very exciting few hours of fishing! We returned to the boat knowing the trip was over, but also knowing we would be back! This was a great trip with a great group! 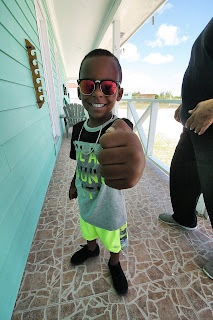 Our food was tasty and there was plenty of it: we enjoyed all the traditional favorites including cracked conch, fresh snapper, baked chicken, steamed fish, conch chowder and great salads with fresh vegetables. Breakfasts were hardy and lunches included sandwiches, granola bars, chips and candy bars. We love the little bar/dining room that sites right on a beautiful white sand beach. 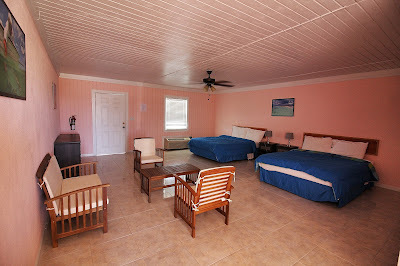 Our rooms were very large with powerful A/C units and hot showers. All in all, this is a rustic but very comfortable lodge. 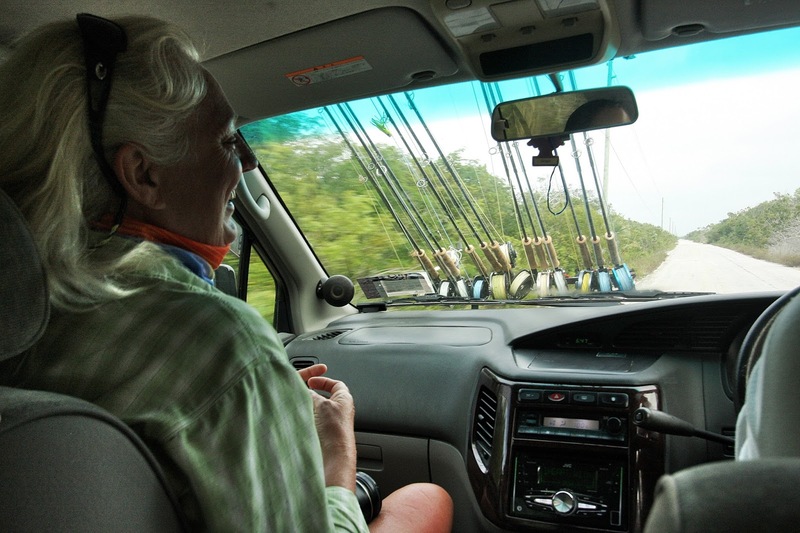 We had a very attentive staff and of course, great guides that helped us explore this sensational fishery. We will be back! To Scott Sawtelle, John and Anna Riggs, Steve Peskoe, and Mike Schwartz, many thanks. Looking forward to seeing you all again soon! 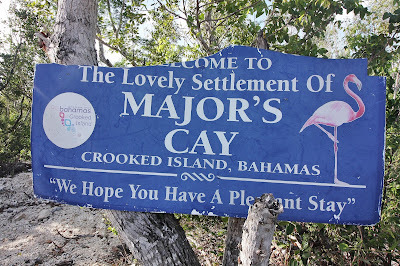 We had such a great trip last year to Crooked Island, we decided to return this year. 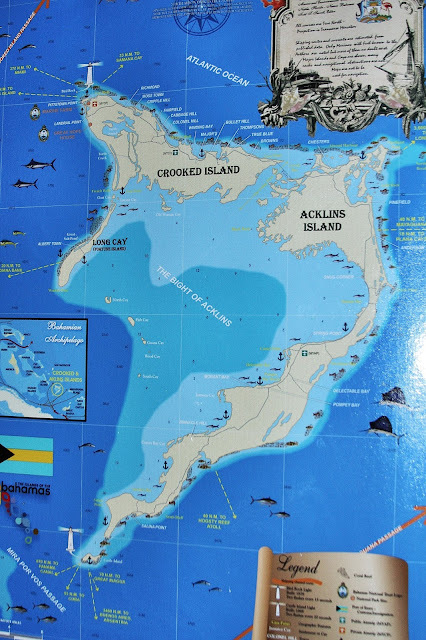 As you might remember, in the fall of 2015, Crooked and Acklins Islands were ravaged by Hurricane Joaquin. Today, the evidence of this massive storm is still everywhere: we motored by areas where the mangroves have been stripped bare, we drove on roads scoured clean of asphalt in places and passed through settlements where a few of buildings had been reduced to rubble. But the islands are recovering. Some of the mangroves are sprouting green leaves, buildings are being repaired and many of the roads are now open. 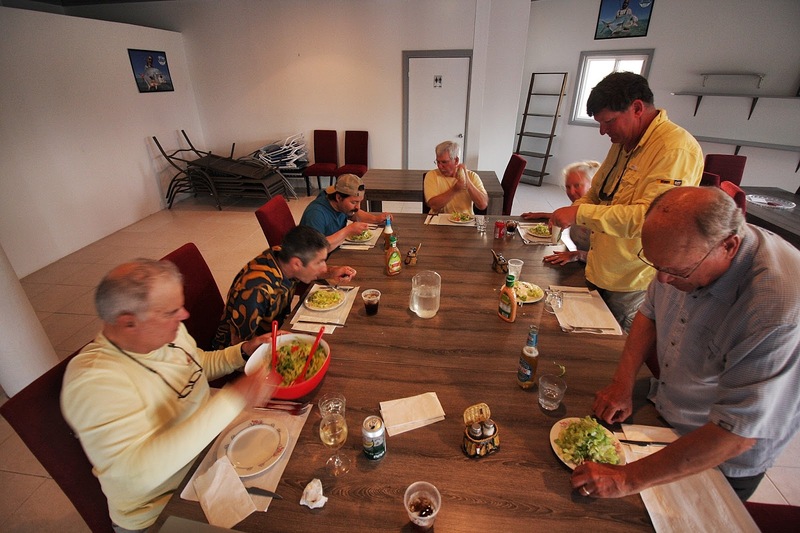 Our guides and long time friends Clinton, Kenny, Michael, Randy and Elvis represent well the islands' resilient crew. We were happy to see these communities making such a strong comeback! Mike Schwartz and I fished with Kenny Scavella. We spent the morning searching for permit, but with freshening winds and an increasing high cirrus cloud cover, we only got one good shot and it was upwind and behind us. 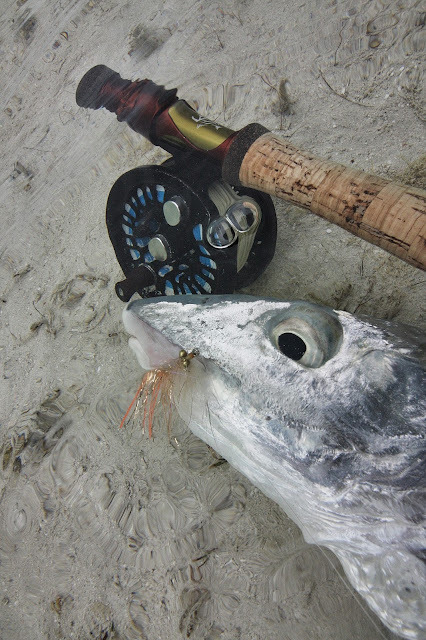 If we had only seen this big permit earlier ...but we’ve all heard thus before. Oh, what a difference these days in May this year would bring. A strong cold front brought lower temperatures and higher winds. The water stayed cool all day and the fish were there... if you could see them and position yourself so you weren’t casting directly into the brisk wind. Doug Jeffries and I fished with guide Elvis Collie. Elvis lives in Lovely Bay on Acklins Island. We met Elvis at the ferry dock on the Crooked side of the two island. We didn’t have to go far to find fish. 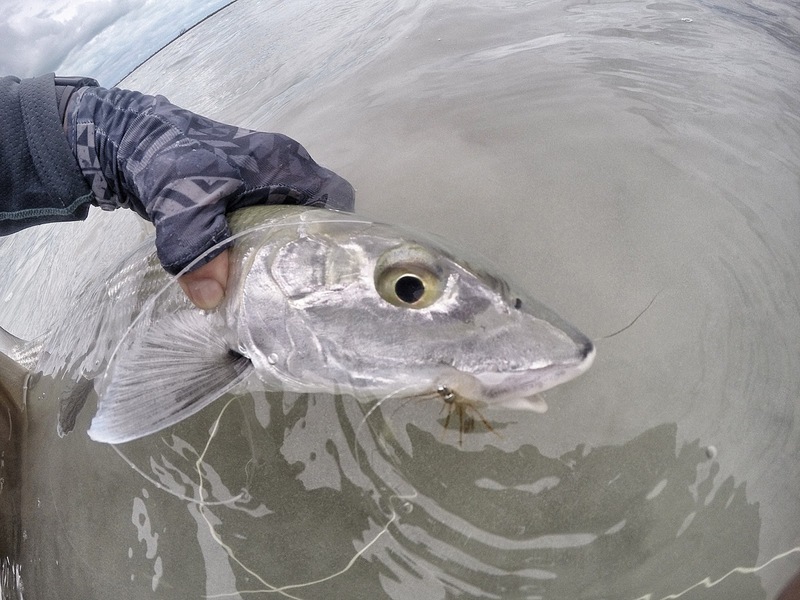 Despite no sun and a brisk easterly wind, we once again found fish often tailing in very shallow water. Our morning was very productive, then we motored to the “Race Around” where we had trouble finding fish on the dark bottom with no sun. 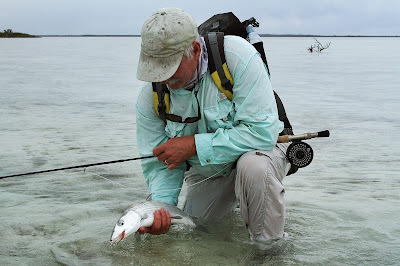 After a couple good fish, we backtracked to a white sand flat where we hoped to find fish coming out of the mangroves seeking deeper water as the tide dropped. "The strong easterly wind suddenly shifted direction to the south. Our cloud cover thinned and the late afternoon light became weirdly phosphorescent. Elvis pulled up to a beautiful white sand bar that guarded two channels which were separated by a small coral cay. 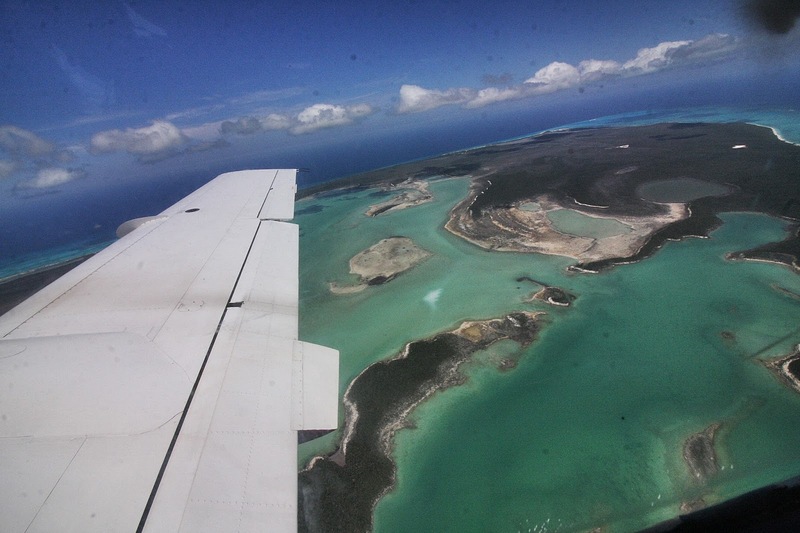 Beyond this cay was an extensive shallow flats system. We had arrived at slack high tide. Soon the tide would begin to fall and all the water on these flats would drain out these two channels. We were positioned perfectly. 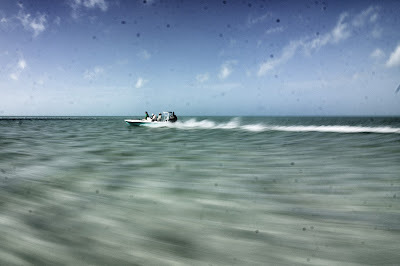 I eagerly jumped out of the skiff, tromped across the sand bar and began to wade inland. I waded swiftly and somewhat noisily. I wanted to find a fish before we ran out of time and told myself as soon as I busted one I would slow down. The flat started out quite firm, but this solid level footing soon gave way to steep hummocks. Then, after a few more minutes of walking, the bottom became not only steep, but also sticky. As I slogged from hill to valley cursing the bottom, I busted three or four good fish. Under the light cloud cover, I hadn't seen them, not that I was working very hard to do so. I immediately stopped and took a moment to look and listen. I told myself, "Where you find one fish, you’ll find many". Taking my own advice, I stopped moving inland and began to wade very slowly across the flat careful to keep the water at the same depth. Soon I saw a slice of ruffled water. I perched on the top of a large hummock and waited. Everything was so perfect: beautiful low afternoon light, tide at exactly the right level, and now virtually no wind... I wanted the game to start. I told myself if I could only get one fish I would be happy. Of course, I was lying to myself, but it was quite a convincing thought as I searched for the other actors in my play. Suddenly a tail popped up. I flipped an easy cast, moved the fly an inch or so and the fish rushed the fly. I made a long, slow strip and the fish was on. My flyline was quickly pulled to my backing. I retreated to shore. I didn't want to screw up the the flat by noisily chasing the fish off. I quickly landed a 5 lb. bone, sent him on his way with a quick "thanks!" and slowly waded back to the “right depth”. Another fish was ready to go. I repeated my routine. This happened time after time until I began to feel somewhat gluttonous. It simply does not get any better than this: a beautiful flat under perfect conditions with big, solid cooperative, tailing fish. After a couple hours, the wind came up again just as the flat began to empty out. The tide was now ripping into the channels. It would take another lengthy search to find the fish again. Unfortunately, we had run out of tide... and time. I knew we needed to get to the boat and get on with the evening. I could see Doug and Elvis had made the same decision. They were wading quickly towards the skiff. I picked up speed as the flat leveled off. Soon it became hard sand once again. "If I had only gotten these few hours for the entire week, the journey would have been worth it!" This time I wasn't lying to myself!" Anna Riggs and I fished with Randy. The winds had increased to a solid 20 knots overnight and a thick cloud cover squashed my wishful thoughts concerning sunshine today. We were experiencing very odd weather for May in the Bahamas. This was a November cold front that had moved in on us... weird! 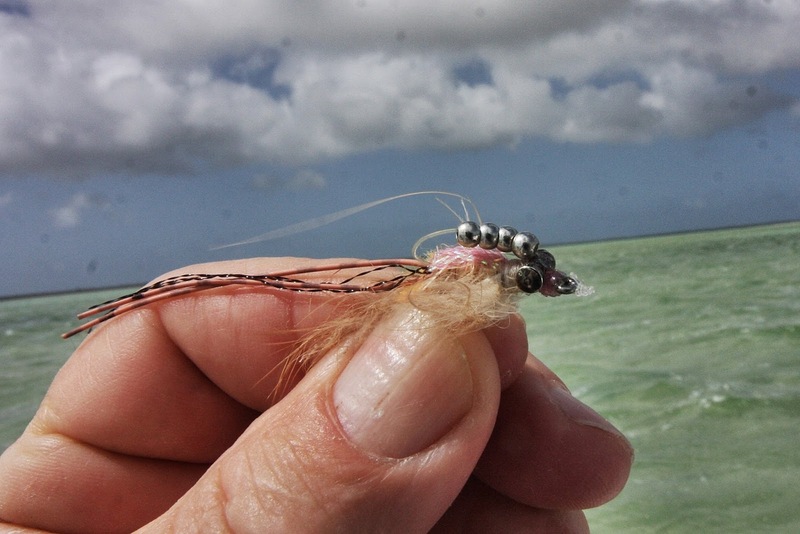 We started fishing on some outside flats that were milky from the wind churning up the fine sand. 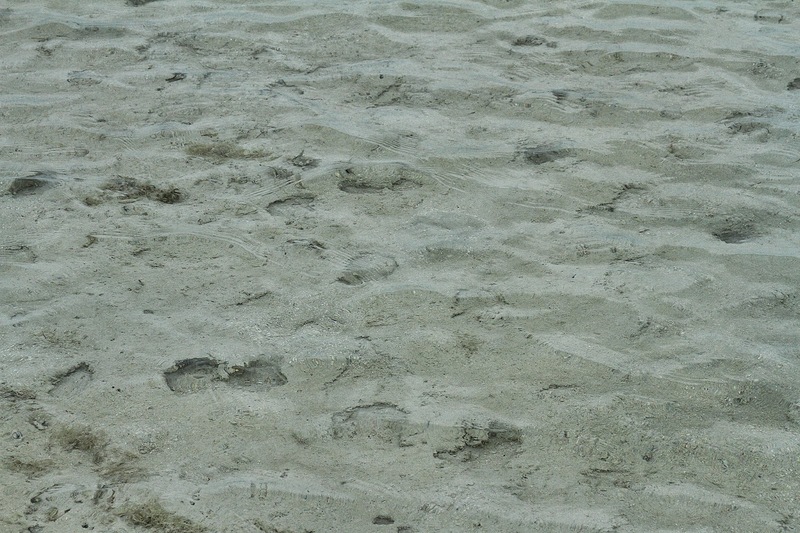 This fine silt made our visibility next to nothing. 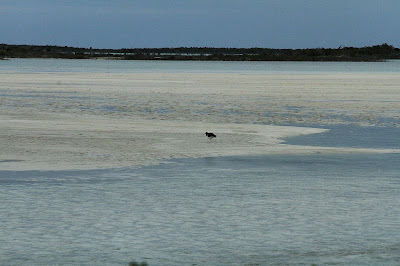 After a brave, but unsuccessful try, Randy took us to a large shallow interior lagoon. This “lake” could probably only be accessed by fish on a high spring tide. Now the opening was dry, about 10 feet across and clogged with hurricane debris. Initially, we waded through a sticky ooze, but that soon gave way to a soft, but firm enough bottom. 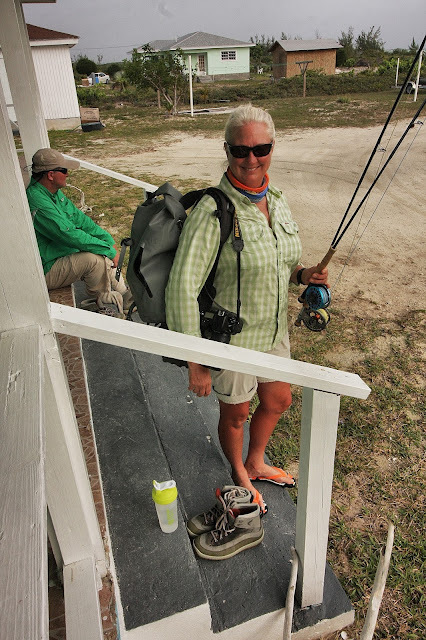 I crossed a channel to wade while Anna and Randy took off on the near side to search for fish. The tide was slowly rising as water now seeped into the narrow opening. 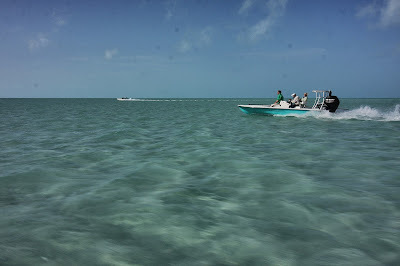 I almost immediately began to spot fish where the channel met a shallow pan that extended into the islands interior for miles. 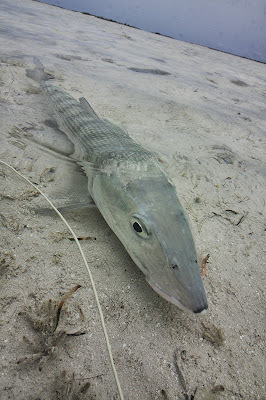 I picked up a few nice fish, then spied some big fish tailing off to my left away from the direction we were wading. I turned around ignoring the ever-softening marl. The tails drove me on making me unwilling to turn back despite this increasingly sticky footing. My efforts were rewarded as I spotted and caught fish after fish. With each catch a muddy patch drifted slowly away from me. 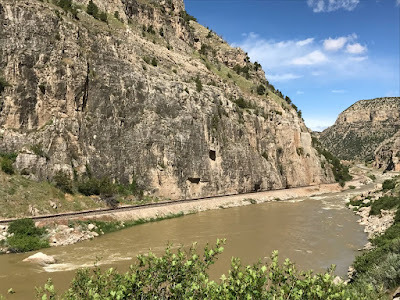 When I stopped, I sunk into the marl which required considerable effort to get “unstuck” and move on. I often initially spotted the fish weaving in and out of the mangrove bushes and had to wait for them to come out before I could toss a cast. Once hooked, I had to pursue many of these fish by taking the pressure of my line and passing my rod through the bushes. Each time I bent to this task, I hoped I wouldn't break my rod in the process. 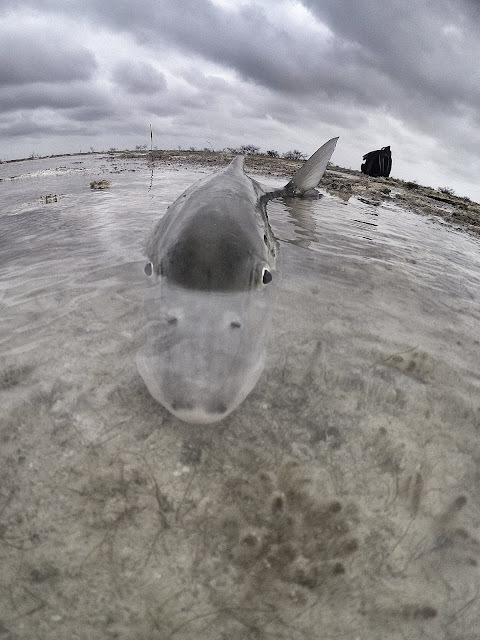 These fish used every arch and keyhole in the mangroves in their attempt to escape. Looking back, a muddy fingerprint showed every twist and turn the fish had made. This was very engaging, if a bit exhausting fishing. 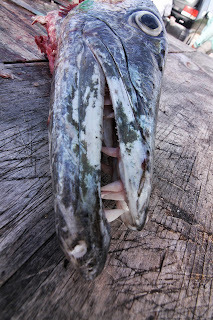 By the time I waded back to the boat for a very late lunch, I was a sweaty, gooey mess. 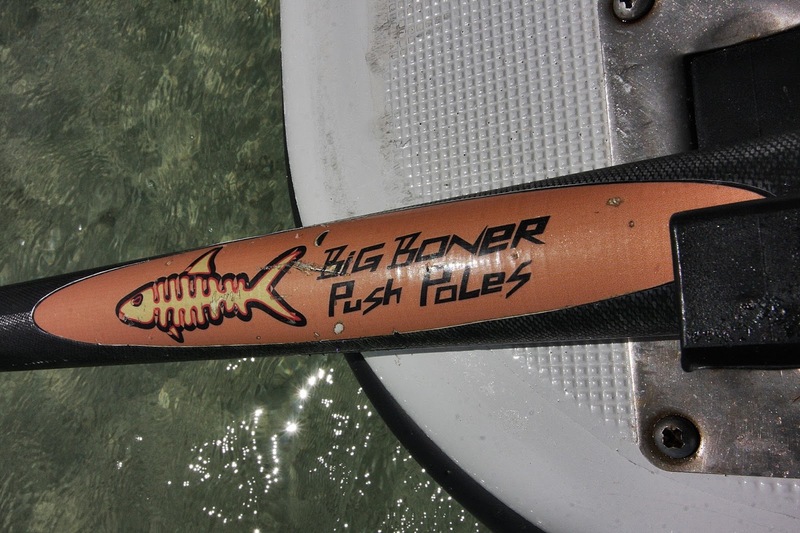 We spent the last hours of the day casting for tarpon and snapper up against the mangroves. Anna caught a nice mutton snapper that a 6' blacktop surfaced to grab. 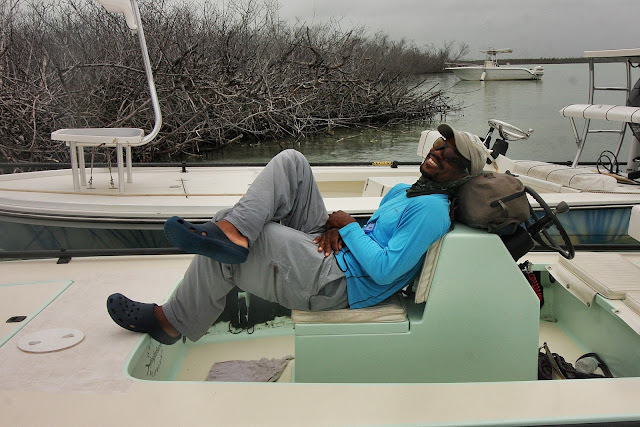 We saw a few tarpon, but again, with the cloud cover, we didn't see them early enough and they were spooked by the time got off a cast.